Masaharu Morimoto, known to millions as the star of Iron Chef and Iron Chef America, has opened Morimoto Maui, the signature restaurant at the new Andaz Maui at Wailea. Morimoto Maui features an intimate and stylish dining environment and offers Chef Morimoto’s distinctive cuisine, which seamlessly integrates Western ingredients with traditional Japanese culinary sensibilities and techniques. Open for lunch and dinner, the restaurant boasts a dramatic, yet warm and welcoming décor on the shore of majestic Mokapu Beach, capturing the essence of Hawaii’s lush and tropical setting. Morimoto Maui features high-quality, fresh ingredients, including locally grown fruits and vegetables, and a seasonal and ever-changing selection of seafood sourced from local waters and markets around the world. This includes Chef Morimoto’s famed raw fish, which is procured from the world’s finest seafood sources, including overnight shipments from the renowned Tsukiji fish market. The menu blends signature Morimoto dishes like Tuna Pizza, Wagyu Beef Carpaccio, Braised Black Cod and Spicy King Crab, with local delicacies, such as locally caught Snapper in a Thai curry sauce with mussels and Pohole ferns and Morimoto Maui Onion Soup, both served exclusively in Wailea. 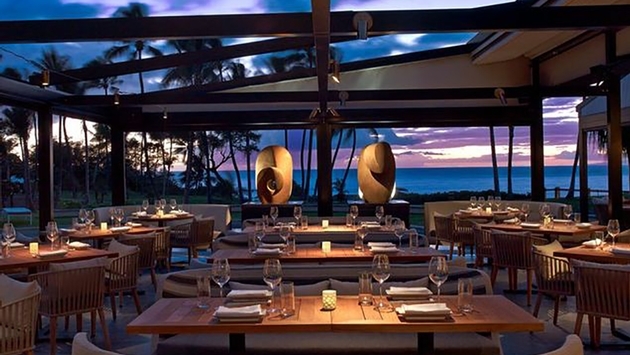 At night, Morimoto Maui is the ultimate culinary experience for locals and travelers alike. Guests can enjoy several of the acclaimed Chef’s signature dishes as well as a selection of new menu items that have been created especially for the Hawaiian restaurant. A hallmark of any Morimoto dining experience is the Omakase menu, which literally translates to “in the chef’s hands.” This multi-course tasting menu most vividly expresses Chef Morimoto’s culinary style. Offered exclusively on the Omakase menu is the Washimi flatiron steak, a Hawaiian born cattle crossbred with Japanese Wagyu, and raised in Oregon. The dessert menu boasts many local ingredients, and includes “The Road to Matcha,” a green tea cake with Kula strawberries and white chocolate rocks. Available only on the Omakase menu is the Brown Rice Panna Cotta, using the husks of the restaurant’s house polished rice, served with an ice cream made from local Miso and butterscotch. Morimoto Maui’s beverage program features an extensive wine list and Chef Morimoto’s own custom-brewed Junmai, Junmai Ginjo, and Junmai Daiginjo premium sake, rare 5-, 10-, and 30-year aged sake, and Morimoto Soba Ale, Morimoto Black Obi Soba Ale, and Morimoto Imperial Pilsner from Rogue Breweries. The cocktail menu highlights local produce and spirits. The Pineapple Farm incorporates local Maui Gold Pineapples, Morimoto Junmai Sake and Hula O’Maui Sparkling Pineapple wine. Japanese ingredients are featured in other cocktails, such as The White Lily, a blend of Calpico, Sudachi Shochu and Yuzu juice. For Morimoto Maui, Shawn Sullivan of Rockwell Group, designed a concept that was inspired by a modern Japanese beach house. Featuring operable French doors on three sides of the dining room, Morimoto Maui opens up to the extraordinary views and the calm beauty of the island. Uninterrupted 180-degree beach and ocean vistas are offered from nearly every seat in the restaurant and bar, further connecting guests to their environment through an intimate, relaxing experience. Neutral toned materials and shading elements and hand-crafted components have been incorporated into the design. Japanese sculptures, decorative lighting and indigenous stones and woods express the local culture and heritage of the island, while Asian-inspired forms used throughout the spaces evoke the restaurant’s cuisine. An intimate 138-seat restaurant, Morimoto Maui features some of the world’s most highly trained culinary talents. Morimoto Maui is located at 3550 Wailea Alanui Drive in the Andaz Maui at Wailea, overlooking the picturesque Mokapu Beach. For reservations call 808-243-4766. Lunch and dinner will be served daily with lunch from 11:00 a.m. to 2:30 p.m. and dinner from 5:30 p.m. to 10:00 p.m. The bar and lounge offer lighter fare from 2:30 p.m. – 5:30 p.m.
For more information on the resort, please visit http://maui.andaz.hyatt.com.